Guan Yu can use any red card as an attack. Once per turn, Guan Yu can compete with any other player. 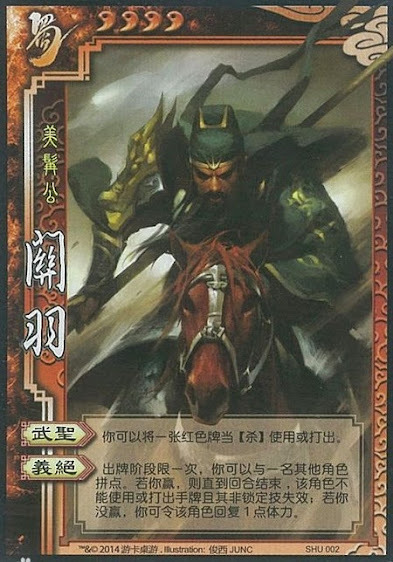 If Guan Yu wins, the other person cannot use any cards from their handor optional character abilities for the rest of the turn. If Guan Yu loses, he can let the other person recover one health. "Fighting Saint" is the same power as the original Guan Yu. When Guan Yu wins the competition with "Absolute Loyalty", the target not only loses access to their hand, they lost all their optional character abilities. This means that the only powers that they will still have are the ones in which they do not have a choice in using. If Guan Yu loses the competition, he can decide if the other person recovers or not. This means that Guan Yu can compete with a friend to give them more health and does not suffer if he loses the competition to an enemy.